Combine a tour of Marlborough wine country with a visit to the Omaka Aviation Heritage Museum, with round-trip transportation in between, during this 5-hour shore excursion from Picton. Wine tasting, all entrance fees, and round-trip transportation from the cruise port are included. This small-group tour ensures personalized attention and an intimate experience. Take the free shuttle buses or follow the short walk from the cruise ship to the Picton i-site where your local guide will be waiting. Departure times may vary, depending on the time your cruise ship berths. Departure instructions will be provided at the time of booking. Disembark your ship in Picton and meet your waiting guide. With your small group of 12 passengers or fewer, climb into a comfortable tour vehicle and take off through the picturesque areas of Blenheim and Picton on your way to the Marlborough Region and Omaka. 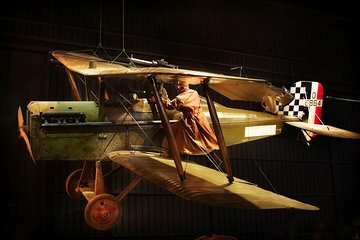 Make you initial stop at the Omaka Aviation Heritage Museum, home to a standout collection of WWI and WWII fight planes and some early 'flying machines.' If you're hungry, you can purchase lunch or snacks at the museum's restaurant. Embark on a winery tour of the Marlborough region, including both boutique, family-run wineries and larger production vineyards. You'll stop at 2 or 3, depending on time, to stroll through the barrel rooms, the vineyards, and learn how the grapes are processed. Wine tastings include the region's famous Sauvignon Blancs. You'll also taste artisan chocolates at a nearby factory. Make the trip back to Picton for drop-off in time to catch your departing ship. Another great excursion the museum is a MUST visit and the lunch delicious . BEST AIRCRAFT DISPLAY IN THE WORLD. We only had an hour and had to choose between WWI and WWII exhibits. We chose WWI. The displays and the volunteer guide were fantastic! It is a living history museum because it contains so many precious items and stories. I bought the book so I can read about some of the things we missed. Of course the winery tours were good too. The lunch at Giesen Winery was great. Fantastic smoked Green Mussels. Our professional tour guide was great. Some day I would like to visit Wings of Omaka again and spend the day there. We felt very rushed. We met our tour guide at 8:30 along with another couple from the cruise. There were two vans scheduled for this tour. The other van left basically on time because all of their tourists were on time. Our guide waited for another 30 minutes when two other couples arrived. He then waited for an additional 15 minutes because two more people were scheduled for his van. After waiting for a total of 45 minutes, we took off for our tour. We rushed thru the Wings of Omaka museum and also skipped one of the Marborough wineries. This was a well organised tour, and the tour guide Mike and Rob were friendly, informative and always keen to ensure the trip went well including Rob playing cards with our children whilst we were doing the wine tasting. Our only negative was that the lunch stop took too long due to the busy-ness of the restaurant, which caused one of the tasting stops to be cut short. Mike assured us the next stop would be better which was correct - and Mike was able to ensure that we 'caught up' at the next stop, but in hindsight the lunch stop could have been somewhere else, offering quick, light snacks perhaps. Mike did say on the day that he would be proposing not to use the restaurant again, and so this issue may have been already resolved for future tours. Sue and Mike from Jade Tours were fantastic. Sue was knowledge, friendly and accessible. She was happy to provide answers and accommodate slight changes in the itinerary. Wings of Omaka is one of the best aviation museums I have visited. The displays were amazing. They were created by Weta Workshops and are very realistic. The wording on each display was easy to read and understand. The wineries that Sue took us too were interesting and provided an insight into wine making in the Malborough regions. She avoided the wineries that the cruise ship tours were attending so that we had an intimate experience. All in all a fantastic experience. Mike was a terrific guide. Had infinite knowledge of the geography. Wings of Omaka truly amazing but excursion only covers entrance to one of two exhibits. We would have preferred to spend a bit more time so we could of had the option of viewing both exhibits. Visited 4 winery cellar doors. Were able to taste 4-5 wines at each winery. Beautiful countryside. Pick up and drop off went very smooth.